Finger tip control with the QS50 Quickstick, can be mounted in the arm of the captain's seat for relaxed total control. The QS50 Quick Stick is a 2 axis joystick for arm rest and desktop mounting. It is designed for operation in an AP50 autopilot system and is interfaced to the autopilot via Robnet. 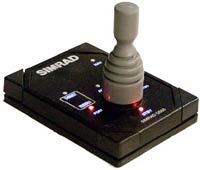 Mode change is made directly with the joystick and by means of push buttons thruster and WORK mode can be toggled On/Off. NFU power steering is provided with an automatic center rudder function.